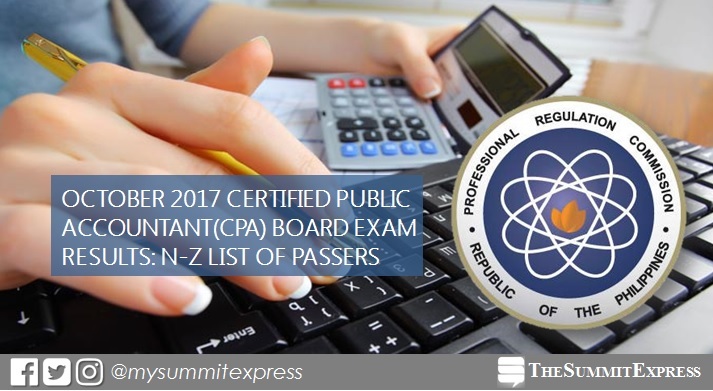 MANILA, Philippines - (Updated November 2) The October 2017 CPA board exam results, including the alphabetical list of passers are available on this page as released online on November 2, 2017 or in ten (10) working days after the exam. 4,511 out of 14,816 passed the Certified Public Accountants (CPA) exams, PRC said. From November 9 to 21, registration for the issuance of Professional Identification Card (ID) and Certificate of Registration will be done on-line. Please go to www.prc.gov.ph and follow instructions for initial registration.